Add twenty years to your life enjoying the LANTZ Supporter! 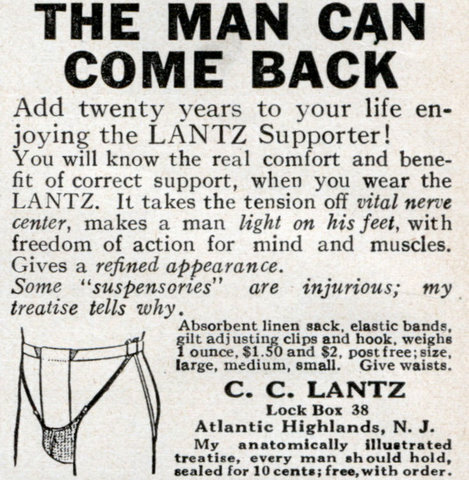 You will know the real comfort and benefit of correct support, when you wear the LANTZ. It takes the tension off vital nerve center, makes a man light on his feet, with freedom of action for mind and muscles. Gives a refined appearance. Some “suspensories” are injurious; my treatise tells why. Absorbent linen sack, elastic bands, gilt adjusting clips and hook, weighs ounce, $1.50 and $2. post free; size, large, medium, small. Give waists. Lock Box 38 Atlantic Highlands, N. J. My anatomically illustrated treatise, every man should hold, sealed for 10 cents; free, with order. Shouldn’t this be also added to the ‘Origins’ file as the first male thong?